Lavazza is Italy’s favorite espresso, commanding almost half of the retail coffee market in Italy. The company started in 1895 when Luigi Lavazza purchased a small grocery store in Turin, in the north of Italy. At the turn of the century, grocers purchased raw coffee, then roasted and blended the beans according to customer requests. Luigi expertly developed his skill in creating coffee blends and in roasting techniques. The business quickly expanded to include the wholesale market. He had his 3 sons join the firm and by 1927, that grocery store had grown into a specialized coffee production enterprise. *Discount valid fthrough 05/19/2015 on EnjoyBetterCoffee.com with no minimum order. Not valid with other coupons or with special sale items. *Discount valid through 5/12/2015 on EnjoyBetterCoffee.com and EnjoyBetterTea.com with $30 minimum order. Not valid with other coupons or with special sale items. Women had unique roles in the centuries-old coffee culture of Germany. Surprised? Consider the earliest days of coffee, when European coffee houses were opening in the 17th century. Most coffee houses did not allow women to sit inside, particularly true in England, where the rules were very strict. But in Germany, women frequented the coffee houses, for both coffee and social connections with other women. Talk about being ahead of their time! Occasionally, men protested the women and the “gossiping”, but the women prevailed. 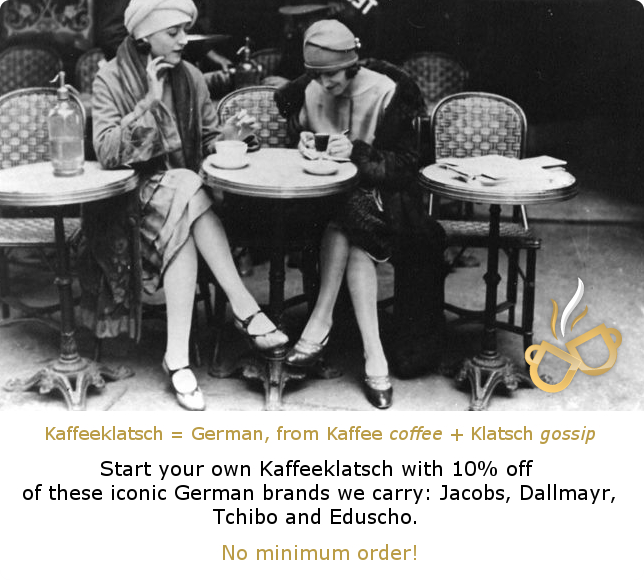 ‘Kaffeeklatsch’ – literally meaning coffee + gossip -became a common term by the 19th century. Another important woman from the time is written about in the Kaffeekantate, which we have written about here before. This cantata is a comical composition written by JS Bach about a woman who needs to drink coffee at least 3 times a day. Her father worries that she will never find a man to marry because of it! She is clever enough to decide that any marriage will include that she be allowed to have her coffee. But the real heroine in the German history of coffee is Melitta Bentz. This woman lived in Dresden, and she wanted a more efficient way to make coffee at home. At the time, early 1900’s, coffee drinkers at home would either choose Turkish coffee that is made with grounds at the bottom of the cup or you could strain the grounds through a cloth. This straining method worked, but was messy and time-consuming. Melitta took a piece of paper from her son’s school book, pressed it inside a small metal pot in which she had punctured holes and the first drip coffee maker was born! She had it patented in 1908 as the “Filter Top Device Lined with Filter Paper.” As you probably know, she went on to create a company that still exists today to sell this product. *Discount valid through today, 5/5/2015 on EnjoyBetterCoffee.com with no minimum order. Not valid with other coupons or with special sale items.